St. Anastasios was a priest and abbot of Mt. Sinai. His zeal for true faith led him to travel through Egypt, Arabia, and Syria to combat the errors of the Acephalites and Eutychians. His writings show not only a thorough command of Holy Scripture and a wide knowledge of the writing of the Church Fathers and other Christian writers, but also classical erudition and a solid grounding in Aristotelian philosophy. Of his prolific output the most important works are Guide Against the Acephalites and Answers to Questions. It is from the latter that the present passage is translated. St. Anastasios died in great old age in 686. QUESTION: What is the mark of the true Christian? ANSWER: Some say correct faith and pious works. Jesus, however does not define the true Christian in these terms. It is possible for one to have faith and good works, and to be conceited over these and not to be a perfect Christian. A Christian is a veritable dwelling place of Christ, held together by good works and pious beliefs. True faith, without works is dead, as are works without faith. We must, therefore, use every effort to keep ourselves clean from foul deeds so that it may not be said of us They profess that they know God, but in works they deny Him (Titus 1:16), wherefore the Lord says If a man loves Me, he will keep My words, and My Father will love Him, and We will come unto him and make Our home with him (John 14:23). Do we not learn from this that the house of the soul is built through correct belief and good works, and thus God dwells within us. I will dwell in them, He says, and walk in them (II Cor. 6:16). The Apostle also points this out when he says Know you not your own selves, how that Jesus Christ is in you, except ye be reprobates (II Cor. 13:5)? Will not the devil then know whether or not the Master of the house, Christ, is inside your mind? When he sees you angry, or shouting, or using oaths, or foul language, or blaming someone, or abusing him, or finding fault, or reproaching someone, or condemning, or hating, or treating someone unjustly, or being conceited, or boasting, or being elated, or not praying habitually and remembering death, then he knows that God, your protector and provider is not inside your soul. And so, the evil one enters like a thief, not finding the divine light in your heart, and he loots the house of your soul, and your last state becomes worse than your first. From Deuteronomy: And now, Israel, what does the Lord thy God require of thee, but to fear the Lord thy God, to walk in all His ways, and to love Him, and to serve the Lord thy God (Deut. 10:12). From David: Ye that love the Lord, see to it that ye hate evil (Ps. 96:10); The Lord preserveth all that love Him, but all the sinners shall He utterly destroy (Ps. 144:20). And: for not a God that willest iniquity art Thou. He that worketh evil shall not dwell near Thee, nor shall transgressors abide before Thine eyes (Ps. 5:2, 3). From Isaiah: And the Lord has said, This people draw nigh to Me with their mouth, and they honor Me with their lips, but their heart is far from Me: but in vain do they worship Me (Is. 29:12). They seek Me day by day, and desire to know My ways, as a people that had done righteousness, and had not forsaken the judgment of their God (Is. 58:2), says the Lord, and: When ye stretch forth your hands, I will turn away Mine eyes from you, for your hands are full of blood. Wash you, be clean; remove your iniquities from your souls before Mine eyes; cease from your iniquities; learn to do well; diligently seek judgment, deliver him that is suffering wrong, plead for the orphan, and obtain justice for the widow(Is. 1:15-18). From Solomon: The ways of an ungodly man are an abomination to the Lord; but He loves those that follow after righteousness (Prov. 15:9). And: By alms and by faithful dealings sins are purged away; but by the fear of the Lord every one departs from evil (Prov. 15:27). From Sirach: Say not, I have sinned, and what harm hath happened unto me? for the Lord is longsuffering, He will in no wise let thee go… and say not, His mercy is great; He will be pacified for the multitude of my sins: for mercy and wrath come from Him, and his indignation resteth upon sinners (Sir. 5:46). As His mercy is great, so is His correction also: He judgeth a man according to His works… for every man shall find according to his works (Sir. 16:12-14). From St. Gregory of Nyssa, On the Lord’s Prayer: “He Who is good does not have the nature to become the father of an evil will, nor the Holy One of one polluted in his life; nor He Who is changeless of one constantly changing; nor He Who is Life of one dead through sin; nor He Who is pure and untainted of one disfigured by disgraceful passions; nor the bountiful one of a miser; nor He Who is found in every good, in any way of those who are involved in evil. If anyone looking at himself sees that he still needs cleansing and he recognizes his conscience as being full of defilement and evil crimes, and, before cleansing himself of these and similar evils, he insinuates himself into God’s family by calling Him Father, being unrighteous, he calls on the Righteous One, being impure he calls the Pure One Father, his words would be insult and mockery, as if he were naming God as the Father of his own vileness. For the word father indicates the cause of the one who comes to exist through him. “Therefore a man who with a bad conscience calls God his father does nothing other than blame God as the author and cause of his own wickedness. But light has not fellowship with darkness, says the Apostle. Light rather associates itself with light, the just with the just, the incorrupt with the incorrupt. Their opposites, however, relate to their own kind. A good tree cannot bring forth evil fruit (Matt. 7:18). 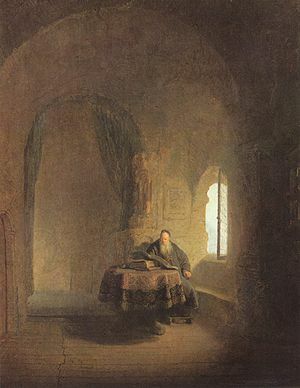 “If then someone who is slow of heart and seeks after lying, as Scripture says, dares to use the words of the prayer, let him know that the father he calls is not the heavenly one, but rather, the infernal one, for he is a liar and become the father of lies, within whomever they be. He is sin and the father of sin. For this reason those who are subject to passions are called children of wrath, and the apostate from Life is called the son of perdition. “Do not philosophize too much, for God has declared it once and for all and said that it is impossible for service of one to be compatible with service of the other. So do not say it is possible. For, when one tells you to seize (others’ property) and the other tells you to free yourself of what you have; one says to be chaste, the other to fornicate; one says to eat and drink, the other to fast and exercise self-control; the one to despise things of this world, the other to cleave to them; the one to marvel at marble walls and buildings, the other not to value these things but rather to pursue philosophy, how is it possible for these to be compatible with each other? St. Basil the Great, from The Ascetics: “If we believe the Lord when He says, Whoseover committeth sin is the servant of sin (John 8:34), and again, Ye are of your father the devil, and the lusts of your father ye will do (John 8:44), we see that he (the sinner) is not only in fellowship, but a slave (of the devil), and his father and his master he calls the one whose work he does. The Apostle also bears witness to this, saying, Know ye not, that to whom ye yield yourselves servants to obey, his servants ye are to whom ye obey; whether of sin unto death, or of obedience unto righteousness (Rom. 6:16)? Nor should faith be dead, as the body without the spirit is dead. And again: Thou believest that there is one God; thou doest well: the devils also believe, and tremble (James 2:19). The Lord asks, why do you call Me Lord, Lord, and do not do what I say? We, who are ruled by the Lord, must confess Him also by our actions, not having sin reigning or ruling within us, so that it may not be said of us that they loved Him with their mouth… their heart was not right with Him (Ps. 77:39). “Let us listen to the Apostle saying, Do not be deceived; neither fornicators, nor idolaters, nor adulterers, nor the effeminate,… nor drunkards, … nor extortioners shall inherit the kingdom of God (I Cor. 6:9,10). And again, no whoremonger, nor unclean person, nor covetous man, who is an idolater, hath any inheritance in the kingdom of Christ and of God. Let no man deceive you with vain words; for because of these things cometh the wrath of God upon the children of disobedience. Be ye not partakers with them (Eph. 5:5-7). If we were to be among these, we who claim to believe, who await the kingdom, we would not be partners of the King, but associates of the King’s enemies. “If we have come to know Christ, we have come to know the Truth. If we know the Truth, we will live in truth, in our deeds. Otherwise, when He comes again, He will put our lot with the unbelievers, saying: Verily I say unto you, I know you not (Matt. 25:12). It will not help us to cry, Lord, Lord. Even the demons believe with an empty faith. Chrysostom, On St. Matthew: “Let us now learn what things defile a man. Let us learn, and shun them. Even in the Church we see among many that they try to keep such a custom, to make an effort to come in clean clothing, and to wash their hands and feet, but not even giving a thought to presenting God with a clean soul. Saying this, I do not forbid anyone to wash his hands and his mouth, but I would that he wash them as is proper. Not only with water, but, instead of water, with virtues. Defilement of the hands is theft, evil actions, attacks on one’s neighbor. (Defilement) of the mouth is blasphemy, abuse, foul language, ribaldry, mockery, insult. “If, then, you are conscious of committing or uttering none of these things, nor being defiled by any of these defilements, come with confidence. Or have you received these defilements a myriad times? Do you rinse your hands and tongue, but carry in them deadly and noxious filth? Tell me, if you had dung and mire in your hands, would you dare to pray? Not at all. There is, however, no harm in these, in the other there is death and destruction. How is it that you show piety in the irrelevant but indifference to what is forbidden? What then, says one, should one not pray? One should, but not in a defiled state and in such filth. What then, he says, if I have been taken by it? Cleanse yourself. How and by what means? Weep, groan, give alms, confess, apologize to those offended by you, be reconciled. With these wipe clean your tongue, so as not to anger God more greatly. “If someone were to embrace your feet with hands full of dung, you would not only not hear him, but even repel him with your foot. How do you then thus dare to approach God? The tongue of one who prays is the hand with which we embrace God’s knees. Do not therefore defile it, so that He may not say to you: Even though you make many prayers, I will not hear you. Death and life are in the power of the tongue (Prov. 18:21). By your words you will be either justified or condemned. You do not dare to pray fresh after the company of your wife, but after abusive and insulting speech and other wickedness you stretch forth your hands before being properly cleansed. How do you not tremble, tell me, calling on that terrible and awesome name? Have you not heard St. Paul say: I will therefore that men pray everywhere, lifting up holy hand without wrath and doubting (I Tim. 2:8). 1. Archbishop Filaret of Chernigov: Historical Study of the Church Fathers (in Russian), vol. 3, p. 178.